Potomac River Water Taxis - and Commuter Ferry? Native Americans used canoes extensively to cross the Potomac River, treating it as a highway rather than as a barrier to transportation. Virginia colonists patented much of the land along the Potomac River in the 1650's and 1660's. Actual settlement took longer, and increased after Bacon's Rebellion in 1676 led to more suppression of the Native Americans. In 1673, the Virginia General Assembly started passing laws to regulate ferries on the Potomac River. In 1702, it defined the first specific location of a public ferry, crossing to Maryland from Col. William Fitzhugh's landing. The next authorized ferry was "from Col. Rice Hoe's to Cedar Point in Maryland" in 1720. In 1720 or soon afterwards, there were enough colonists for Thomas Lee to start a private ferry across the Potomac River. 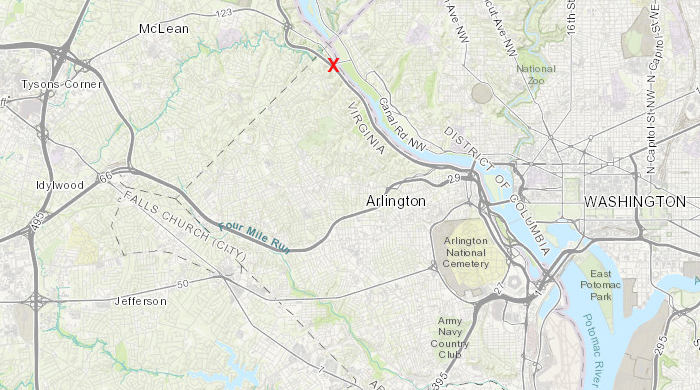 It ran from the mouth of Pimmit Run in Arlington County, at the site of the modern Chain Bridge, to the Maryland shore. It was a part of the Lee family's plans for developing a town or manufacturing operation near Little Falls. In 1738, the ferry was opened to general public use. Francis Awbrey operated it, plus a new one he started that year at Analostian Island. That property ended up being owned by the Mason family, and is now called Teddy Roosevelt Island). Ferries enabled people and cargo to cross the Potomac River even after the first bridge, Chain Bridge, was completed in 1797. Water-based travel on the Potomac River in Northern Virginia increased when the Federal government moved from Philadelphia to Washington, DC in 1800, since Long Bridge was not opened until 1809. In 1964, DC Transit proposed starting a new ferry on the Potomac River designed for commuters. 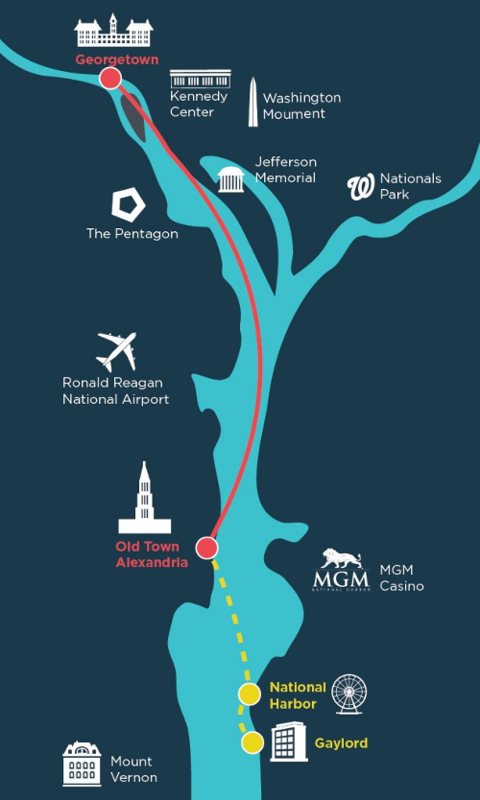 The route would have linked Fort Washington, Maryland, roughly opposite Mount Vernon, to a terminal in the District of Columbia. DC Transit was still a privately-owned company, and the ferry was intended to increase the bus company's profits. The service is more costly to operate than other forms of public transportation that receive local, state and federal funding and are currently in service in the same travel corridor. Local officials in Prince William County have pursued a long-distance commuter ferry option despite the 2000 study's conclusions. 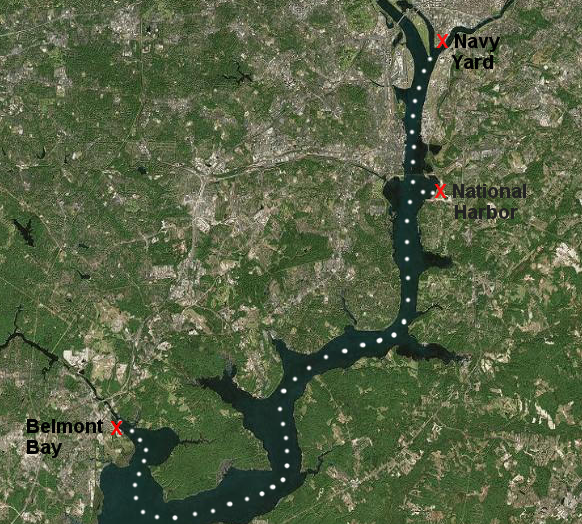 Prince William completed a Potomac River Commuter Ferry Service Study & Route Proving Exercise in 2009, and brought an actual ferry south from Provincetown, Massachusetts to evaluate the time required to carry commuters from Prince William County to the Navy Yard. The 2009 exercise revealed that commuter travel via ferry would be slower compared to other forms of transit. 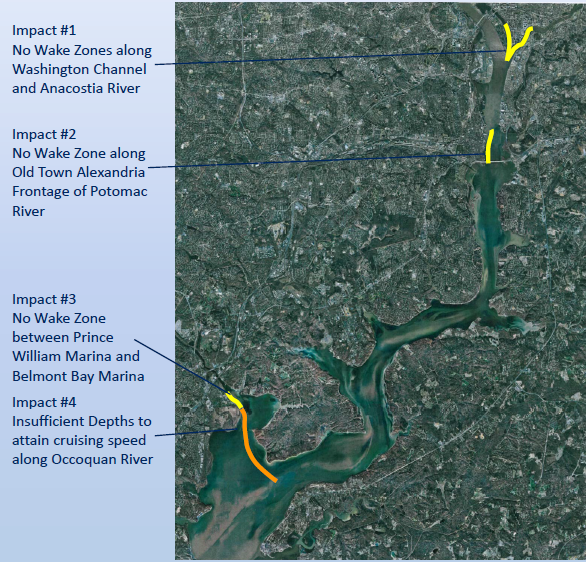 It re-affirmed that delays were caused by wake restrictions requiring slow speeds, especially upstream of Woodrow Wilson Bridge, and the shallow depth of the Occoquan River channel. 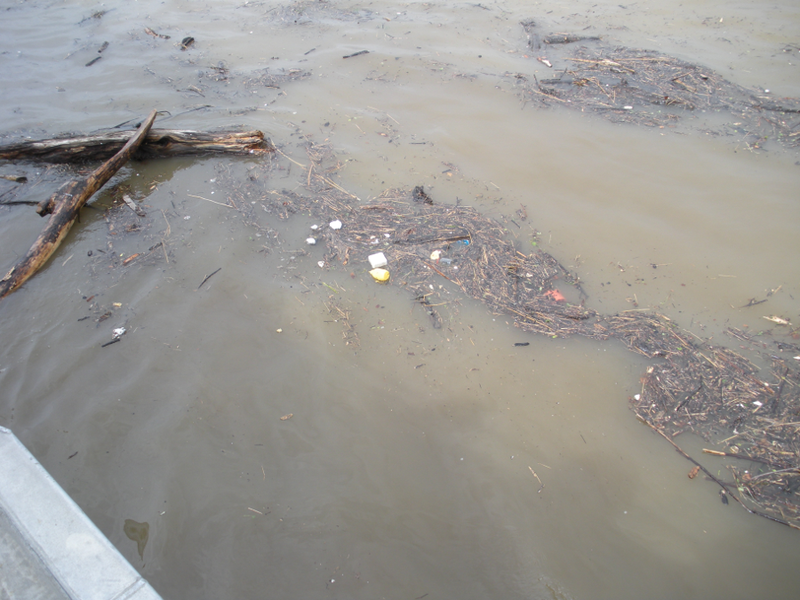 Noise concerns were also identified as an environmental issue to mitigate. The study team found significant potential for a commuter ferry operation to serve that segment of the population currently commuting between Southern Maryland and Virginia. This is especially true for military installations along the Potomac River such as Fort Belvoir, NSF-Indian Head and Quantico Marine Base. 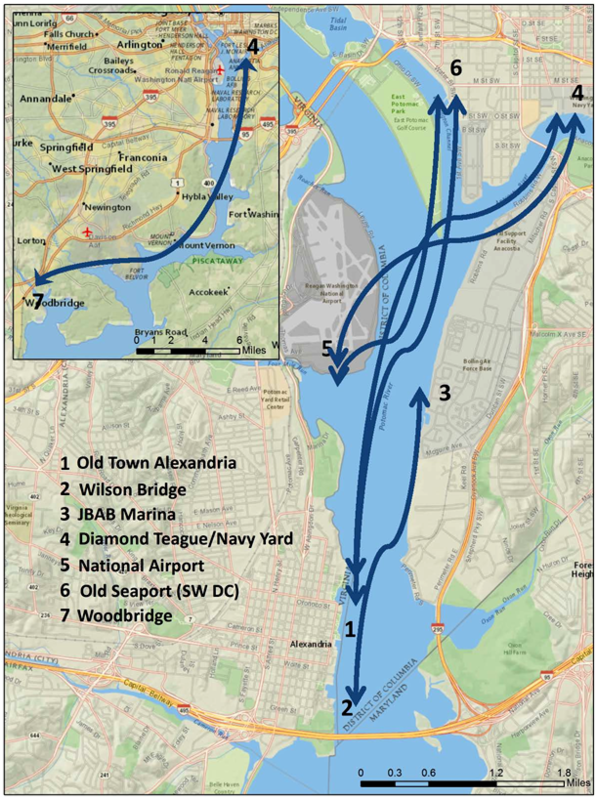 The Northern Virginia Regional Commission issued a 2013 study that declared daily water taxi service among Alexandria, Reagan National Airport, National Harbor and the District would be economically viable. Department of Homeland Security officials were interested in better access to their new headquarters in the former St. Elizabeth's hospital, located in Southeast DC. In contrast, the US Army declared it would not be interested in a commuter ferry to Fort Belvoir. 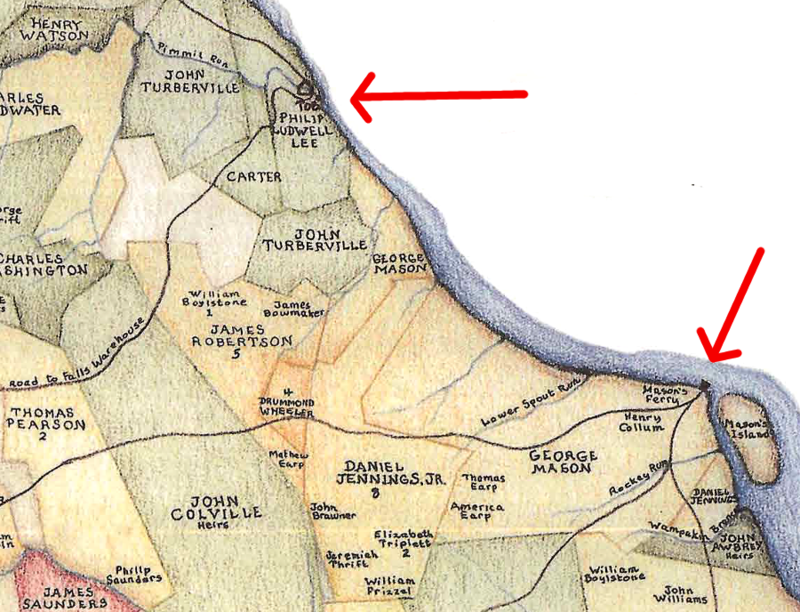 The costs to dredge the Potomac River channel and build a terminal were too high, considering the number of employees who would commute from Woodbridge. 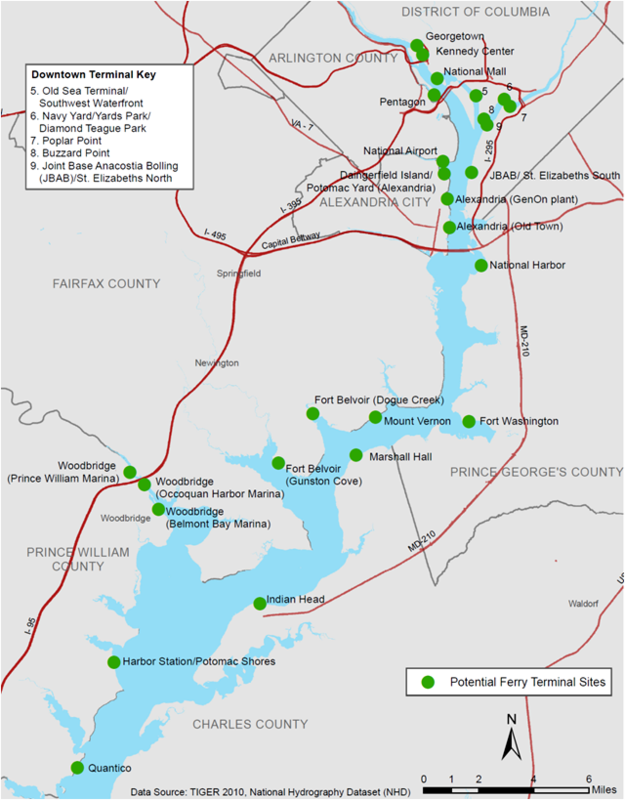 In 2013, the supervisor for the Woodbridge Magisterial District in Prince William County proposed a Commuter Fast Ferry Project to the Virginia Department of Transportation (VDOT). The proposal for a public-private partnership included a three year demonstration project, using three 49-passenger vessels. 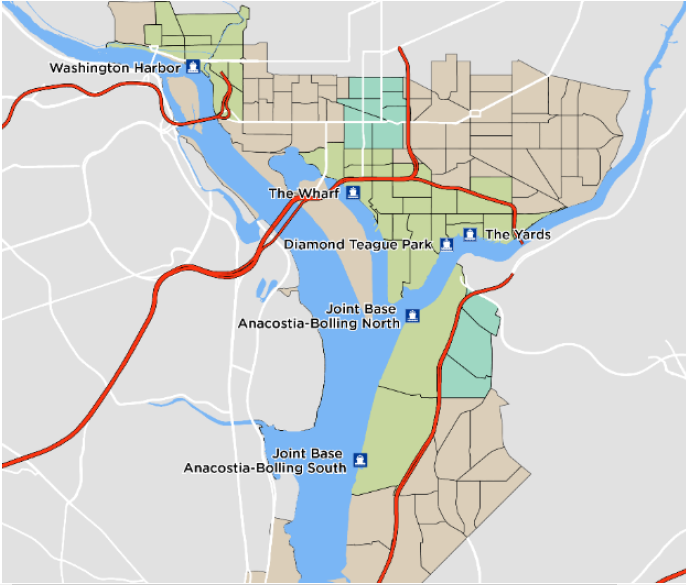 They would carry passengers (not cars) between Woodbridge to the District of Columbia, and connect Alexandria to Joint Base Anacostia-Bolling across the river. In 2014, the Marine Highway designation paid off. The Federal Transit Administration decided to provide nearly $3.4 million for a discretionary (not competitive) grant from Ferry Boat Program to initiate new ferry service on the Potomac River. The grant required a local match of $845,000. Ferry planning continued despite the absence of money to construct a terminal, buy a boat, and start actual operations. A 2015 market analysis by the Northern Virginia Regional Commission examined 26 possible terminal sites and 260 possible routes among them. That study eliminated half of the potential terminals, then evaluated remaining potential routes based on potential number of customers and their potential savings in travel time. 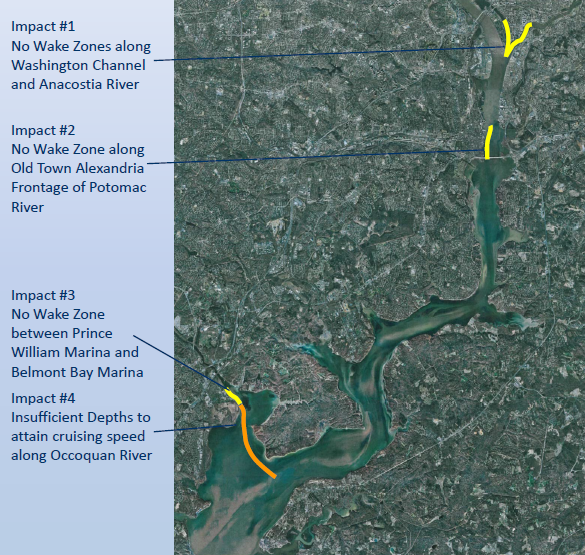 The study did not identify as sustainable a longer-distance commuter corridor, with a ferry terminal at Woodbridge further downstream from Woodrow Wilson Bridge. However, the Maritime Administration provided a $174,000 grant in 2016 to the Northern Virginia Regional Commission to fund yet another long-distance commuter ferry study. Also in 2016, the private company that offered entertainment cruises between Alexandria, the National Mall, and the baseball park of the Washington Nationals team announced it was purchasing four 100-passenger ferries and planned to offer service in 2017 to commuters crossing the river. Based on the analyses done previously, the private company calculated it could make a profit by offering an alternative to short-but-frustratingly-slow drives between Alexandria, Maryland, and DC. Using the funding from the 2016 grant by the Maritime Administration, the Prince William County supervisor who has consistently championed a commuter ferry organized another demonstration of ferry travel in 2017. 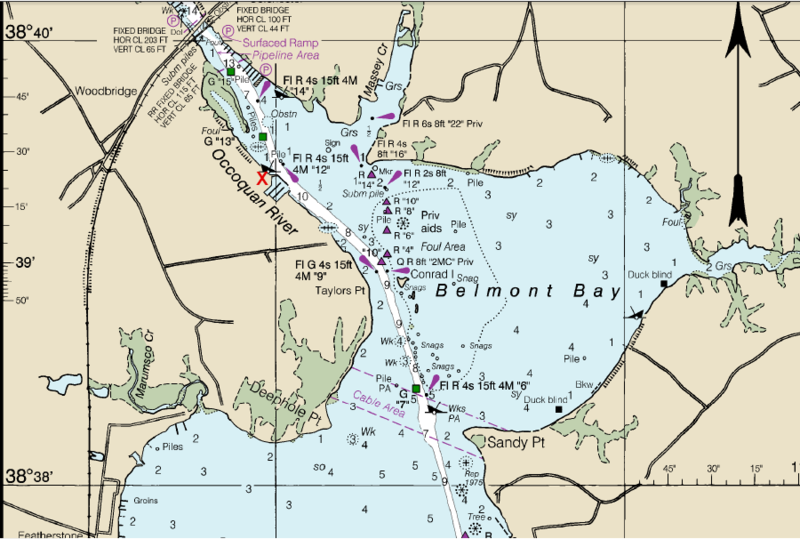 A passenger ferry made two trips from near Belmont Bay, which was identified as the likely site for any terminal because it avoided most of the no-wake zone on the Occoquan River. After the demonstration runs, public presentations revealed that planning was focused using three passenger ferries, each capable of carrying 300-400 passengers. They would each run one trip in morning rush hour and one trip in the evening, so together they could transport 900-1,200 commuters each day. Each ferry would cost $10 million, and costs to build new shore-side infrastructure for a terminal might add an additional $5 million. The head of the private company operating water taxis stated that after seven years of discussion with the Belmont Bay developers, they had still not negotiated a lease for a terminal there. It’s really about the experience. To be able to sit back and relax on real leather seats, read or whatever in an air-conditioned cabin all while looking out at the Potomac River, instead of somebody else’s license plate, all of that is very desirable. Supervisor Frank Principi described the proposed ferry as "an additional transit service." He suggested VRE was already overcrowded, so the Potomac River was the next logical way to move commuters into the District. In 2018, the Potomac and Rappahannock Transportation agreed to administer the grant that had been awarded by the Federal Transit Administration in 2014. Initial plans were to start ferry service with two 400-passenger boats, traveling at roughly 50mph between the Occoquan Harbour Marina in Prince William County and Joint Base Anacostia-Bolling (JBAB) in DC. The pool of initial customers was limited, because the Department of Homeland Security insisted that only people with security clearances could get off the ferry at the base. 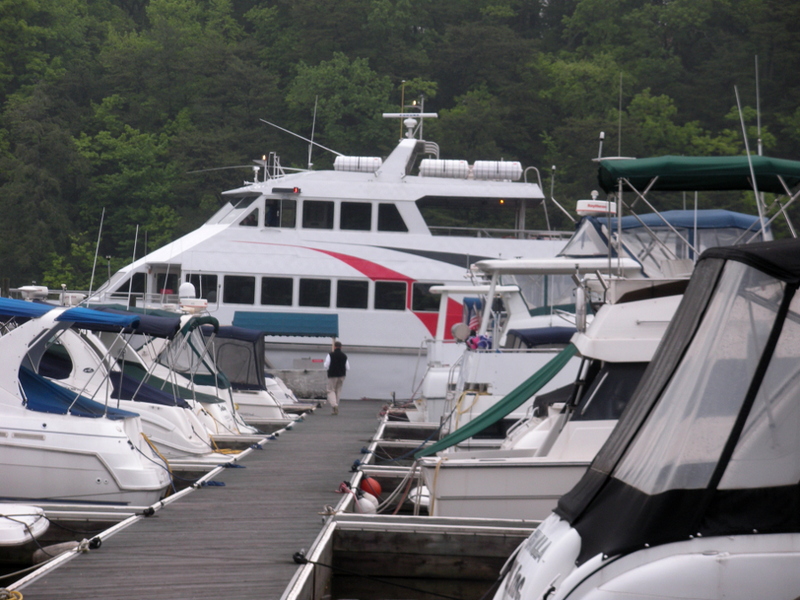 There were an estimated 6,000 people with clearances living within 15 minutes of the Occoquan Harbour Marina, and ferry advocates antcipated they could recruit enough to make the project cost-effective. If the ferry route was extended to transport passengers to National Harbor or a second location in DC, then the pool of potential customers would expand even further. The stimulus for an elected official in Prince William to continue studies of a long-distance commuter ferry is obvious. Commuters are voters, and voters stuck in traffic want solutions. Politicians benefit from proposing new solutions to long-standing traffic congestion problems. Even if studies continue to question the cost/benefit ratio of a new solution, proposing a ferry makes an incumbent or a candidate appear to be a person who can solve the traffic congestion problem. A commuter ferry from the periphery of the DC urban region would solve only the "how to get to work" problem. Ferries would operate as one-way transportation services, carrying commuters in the morning into DC and bringing them back to the suburbs in the afternoon. The proposed ferry offered virtually no opportunity to stimulate development of transit-friendly communities in Prince William. Facilitating the export of workers to DC would not help to convert that county from a bedroom community into a job center. However, the Potomac and Rappahannock Transportation Commission transit officials focused on transporting people rather than stimulating transit-oriented development that would reduce overall transportatin demand. The primary alternative to using I-95 is the Virginia Railway Express (VRE). The railroad trip from Woodbridge to L'Enfant Station would take the same amount of time as a ferry trip to the Navy Yard. Ferry operators needed $15/trip to make a profit, so transit subsidies would be needed to compete with the VRE cost of $10/trip. Greater investment in the VRE offers the potential of converting that commuter rail system into a two-way transit system, with trains running regularly throughout the day as well as at rush hour. With more trains running more often, higher-density development at train stations - as envisioned at the Belmont Station community near Occoquan - could become a reality, rather than stay a long-range vision in planning documents. Creating walkable communities, with retail/restaurant operations next to train stations comparable to the Rosslyn-Ballston corridor, recognize that it takes decades to stimulate such redevelopment. So long as Virginia Railway Express trains run only one-way during rush hours, the lack of service during the middle of the day and the evening will limit developer interest. 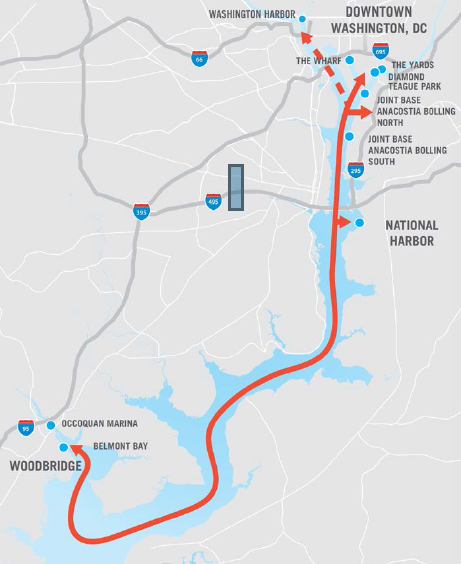 There is no guarantee that increased Virginia Railway Express service would transform Belmont Bay into a neighborhood comparable to Clarendon or Ballston, but offering a peak-hour only commuter route via a ferry is less likely to stimulate Transit Oriented Development in Prince William County. Subsidizing extra trains would require substantial funding for 10-20 years, until the benefits of redevelopment led to increased tax revenues that were directed to the transit service. The potential for using Virginia Railway Express to stimulate transit-oriented development is low on the Manassas Line, though there are fewer conflicts with freight rail use. On the Fredericksburg Line between DC-Spotsylvania County, there are more residents and the demand for mid-day trains is be greater. In addition, additional Virginia Railway Express services throughout the day could be supplemented by the planned expansion of Amtrak services between Richmond-DC. The SmartScale ranking process for projects considered by the Virginia Department of Transportation is tilted towards projects that reduce congestion quickly. Even if the ranking factors never increase the weighting factors for long-term benefits of land use transformation, the analyses of proposed transportation projects in Northern Virginia are likely to favor investment in Virginia Railway Express upgrades over creation of a new commuter ferry system.